Some dialects of English have a feature known as the “double negative”. In these dialects, a negative sentence can contain more than one negative word. For example, a speaker of such a dialect might say “I didn’t see nobody” to express that nobody was seen. As you might know, I like to review grammar books. For this post, I decided to look at the grammar advice offered by university Writing Centres. Virtually all universities have something like this. It’s a place for students who are struggling with assignments such as essays and reports. Generally they’re aimed at first language speakers, but some have ESL support as well. One thing I found was that a number of writing centres offer little or no grammar advice. Instead, their focus is on topics like how to structure essays, how to write for different academic disciplines, how to do a bibliography, and so on. Some offered almost no online advice at all, and their website was mainly a contact page for students looking for in-person help. This is perfectly acceptable, of course, since that’s what the writing centre is for. Some, however, offered guides on grammar, and these the ones I’m reviewing here. I picked three universities for this post, and focussed on only one or two issues in each case. This is to keep the post a readable length, and to avoid repeating myself too much. Many of the issues that I’ll discuss were not unique to a single university, and I could easily have picked a different three (although the website design for the University of Calgary is something special). Traditional analysis of English has a heavy focus on words. 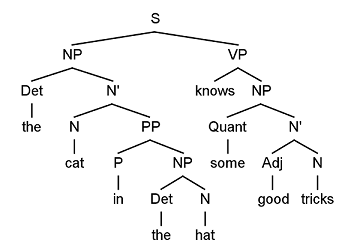 The eight parts of speech, which is a core concept in traditional grammar, is all about classifying individual words. Many prescriptive rules are concerned with which words to avoid: Don’t end sentences with prepositions. Don’t start with conjunctions. Don’t say ain’t. Don’t use singular they. Nearly every “improve-your-grammar” book has a list of commonly confused or misused words: their/they’re/there, who’s/whose, that/which, principal/principle, etc. However, languages are not just big bags of words. Words work together, and they can be grouped into larger units called “phrases”. Phrases are an essential part of any theory of grammar. It’s impossible to properly describe a language without at some point needing to talk about groups of words, instead of just individual words. The most obvious example of such a unit is the “sentence”, which is actually just a very large phrase. A grammar book for you and I…oops me! One serious problem with the available books on English grammar is that there are so many written by unqualified people. Take this one for instance: A grammar book for you and I…oops me!. The author is a lawyer. He has no special education related to grammar or language analysis. What makes him think he can write a book on the subject? And more to the point, why do people buy things like this? Could I write a book on law and get taken seriously? I should hope not. Why on earth would anyone expect a lawyer to know anything about grammar analysis? This is an unusual one. It’s a grammar book, but it’s written in a narrative style. And just look at that cover. Just then my body froze because a truly enormous, hairy spider was crawling up the table leg. I let out a scream that must have been heard for miles around. Tarzan was momentarily startled, but when he spotted the creature he grabbed a knife and slit the thing in half. Then he carried both halves outside. When he came back in and sat down I seemed to be breathing normally again, so I continued, “Basically a noun is a word that names something. It can name a person, place, an idea, or an action”. I thought it might be interesting to talk about why that’s done. Why draw upper and lower levels? Why can’t sentences be “flat”?